Other sports have been highlighted as well. 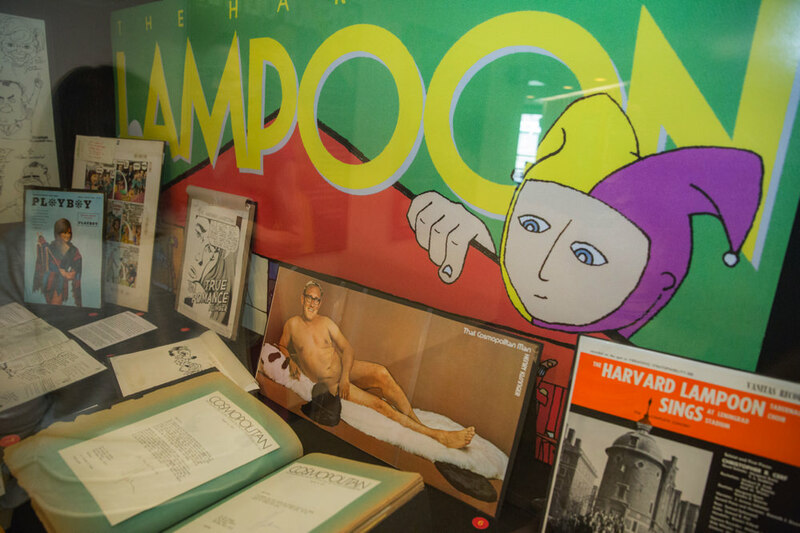 Visitors to Pusey Library this summer have been greeted by a large cardboard cutout of a cow—part of an exhibit celebrating The Harvard Lampoon and the role it has played in Harvard’s comedic history. 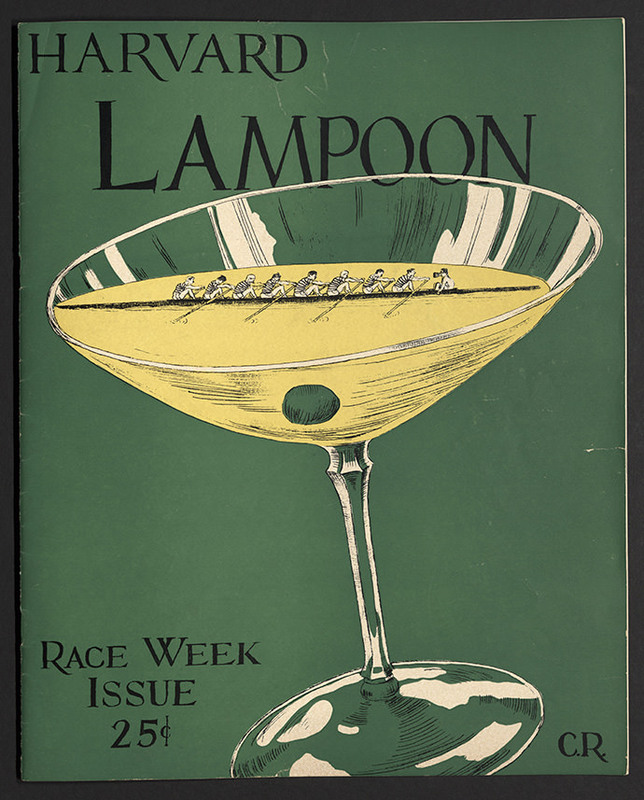 The exhibition, “Remorseless Irony and Sarcastic Pens: The Story of the Harvard Lampoon,” showcases photographs, drawings and other artifacts collected over the course of the Lampoon’s 140 years. The cow is an homage to the Lampoon’s custom of unleashing farm animals on campus for comedic effect. William Randolph Hearst, a member of the Lampoon and the class of 1886—although his pranks resulted in his expulsion—is suspected of having sparked the tradition by releasing roosters in Harvard Yard. 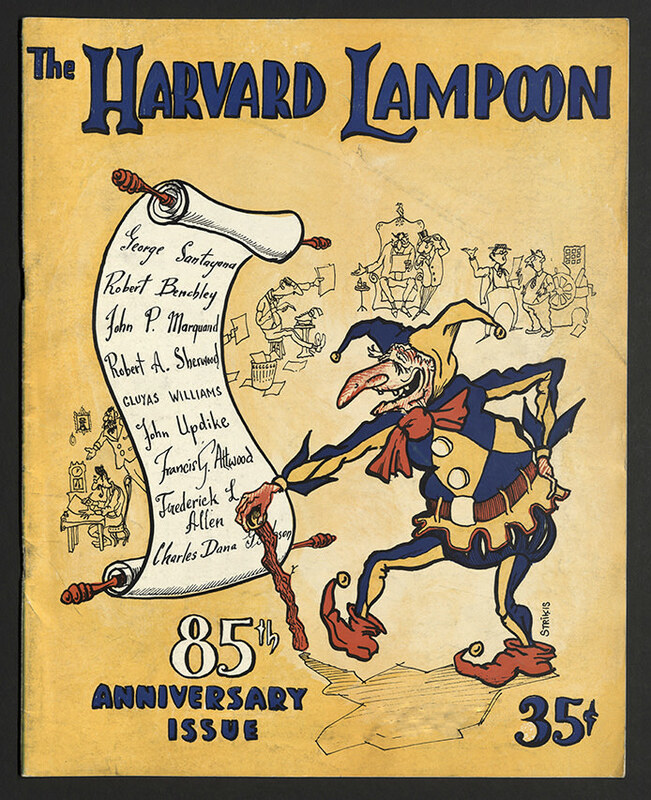 Lampoon members were also blamed for the appearance of a cow in the Yard sometime in the 1930s, which was “forcibly ejected” from the premises by Harvard police. Other, more mundane artifacts are also on display: minutes from Lampoon meetings over the years note milestones such as the official incorporation of the organization in 1902 and the purchase of its modern-day home on Bow Street—the “Lampoon Castle”—in 1909. The building, the exhibit notes, bears a resemblance to a human face; a photograph on display depicts it adorned with oversized sunglasses and a faux cigarette to honor Natalie Wood, who came in person to receive her “Worst Actress” award in 1966. 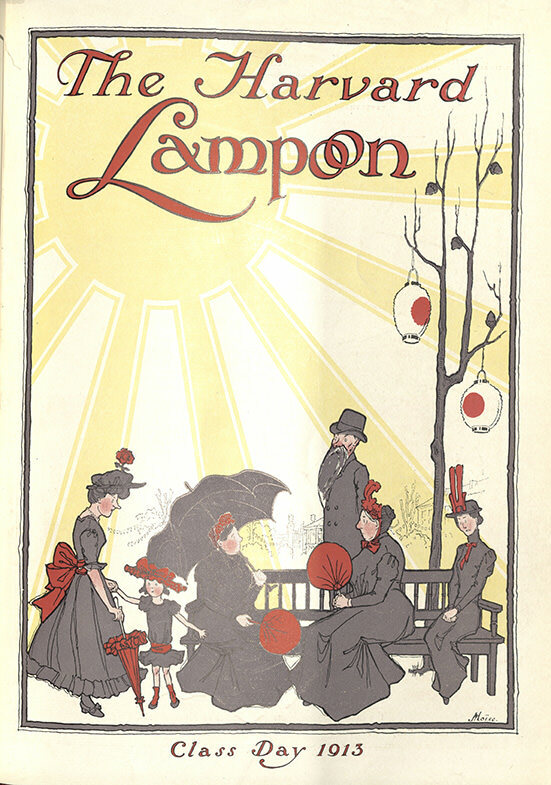 The Lampoon has occasionally even branched out into full-length parodies of novels—a stack of them will be found in one of the display cases—starting with Alice’s Adventures in Cambridge in 1913. Other, more recent editions include 1969’s Bored of the Rings and The Hunger Pains of 2012. 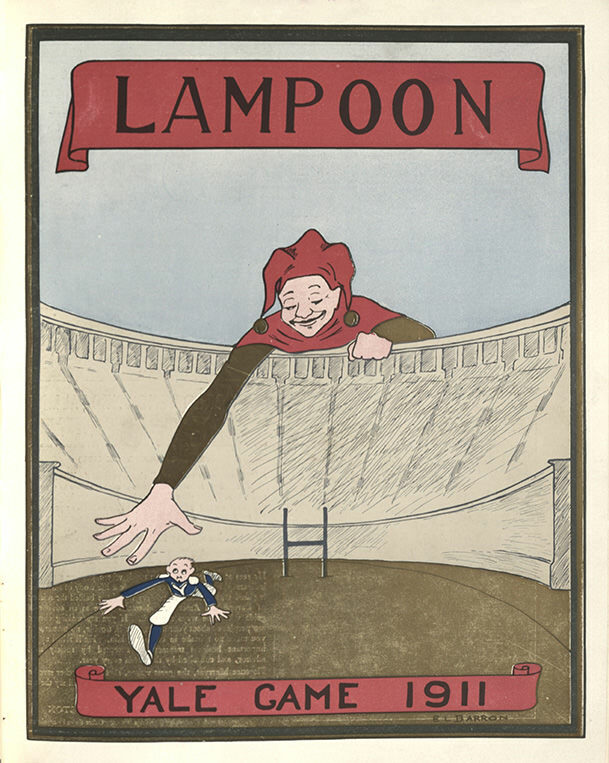 Along one wall of the gallery are examples of the Lampoon’s forays into politics over the years: after beginning with a cover featuring Theodore Roosevelt, A.B. 1880, the magazine has since published a “Red Scare Issue” and a cover illustration of John F. Kennedy ’40 duking it out with Richard Nixon. The most recent political joke in the exhibition is a photograph of Donald Trump sitting in the chair of the president of The Harvard Crimson. (Stealing the chair is part of a long-standing rivalry between the two student publications; the Crimson seeks, in turn, to abscond with the copper statue of an ibis perched atop the Lampoon Castle.) Members of the Lampoon, having stolen the chair, fraudulently convinced Trump he would receive the Crimson’s endorsement in this year’s presidential election—proof that the 140 years of antics have yet to let up. 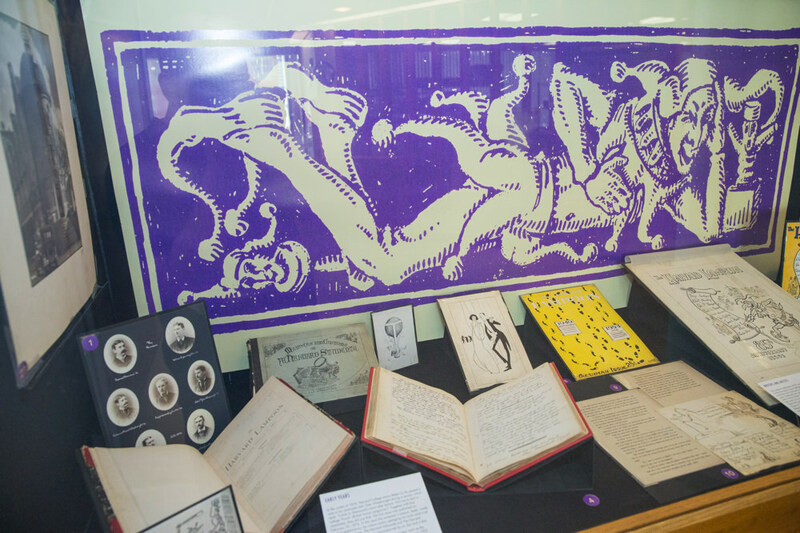 “Remorseless Irony and Sarcastic Pens: The Story of the Harvard Lampoon” will be on view through October 2 on the ground floor of Pusey Library. Aidan Langston ’19 is this magazine’s 2016 Daniel Steiner Undergraduate Editorial Fellow.